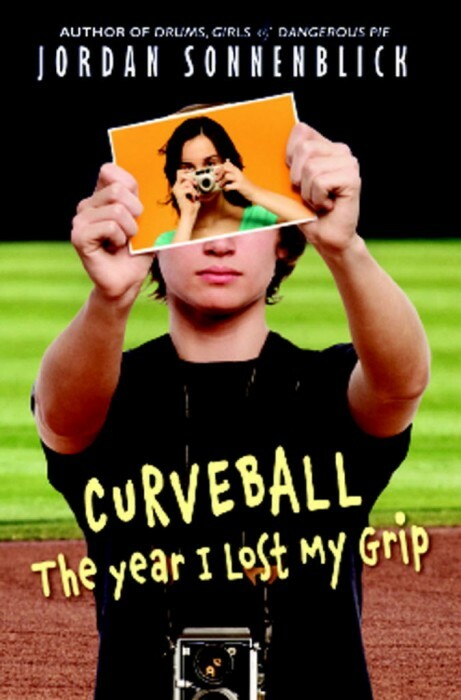 Actually, I can imagine it, because that’s exactly what happens to Pete in Curveball: The Year I Lost My Grip by Jordan Sonnenblick. Pete and his best friend, AJ, have always been the star pitchers and catchers at their school, and they fully expect to dominate high school as superstar athletes. But then Pete gets injured and learns he can never play baseball again. But how can he break the news to AJ when he can barely accept it himself? On top of that, Pete’s beloved grandfather is starting to act weird, sometimes zoning out in the middle of conversation or forgetting even the most basic parts of his life. Between his fading baseball glory and his grandfather’s troubling behavior, it’s lucky for Pete that he meets the super cute and supportive Angelika on the first day of school — and that they get partnered up in advanced photography class. If you’ve read any of Jordan Sonnenblick’s other books, all the pieces of Curveball may seem pretty familiar, especially compared to Notes from the Midnight Driver. A dude with major upheaval in his personal life? Check. An elderly guy who imparts wisdom? Check. A feisty friend/love interest? Check and check. I know a bunch of you have read Sonnenblick’s other books. Have any of you read this one yet? Leave a comment with your thoughts or submit a review! Karen is terrible at baseball. Once she managed to hit the ball into her own head. True story.